Fatty liver disease is commonly called as Non-Alcoholic Fatty Liver Disease (NAFLD) characterized by fat to build up within the liver. Excessive levels of circulating fats (lipids) get deposited in the liver; resulting in inflammation in the liver cells which damages the liver itself. Generally it may not cause any symptoms, but if left uncontrolled may result in cirrhosis of liver (a serious disease). Fatty Liver (NAFLD) increases the risk of cardiovascular disease such as heart attack and stroke, which makes it particularly dangerous for people with type 2 diabetes who already have a higher risk of cardiovascular disease. 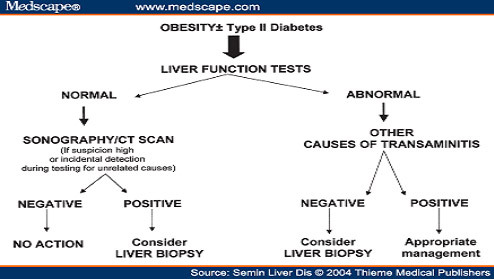 Type 2 diabetes is a risk factor for Non-Alcoholic Fatty Liver Disease (NAFLD). Other risk factors are overweight/obesity, hypertension, alcohol and certain drugs. People who have NAFLD are at a greater risk of developing type 2 diabetes and cardiovascular diseases. 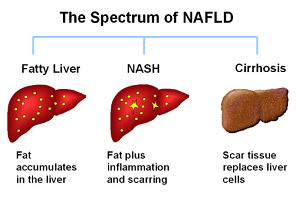 Non-alcoholic fatty liver disease (NAFLD) can be divided into four different stages. Simple fatty liver means accumulation of fat which generally doesn't cause harm. Non-Alcoholic Steato-hepatitis (NASH) means excess fat with inflammation of liver. NASH progresses to Chronic Hepatitis; which later on progresses to Cirrhosis after the development of fibrosis. Fibrosis affects the structure & function of the liver, and can even lead to liver failure. Only a few patients develop NASH, and a minority of these proceed to cirrhosis. I have diabetes, how do I avoid fatty liver disease? Lifestyle modifications i.e. 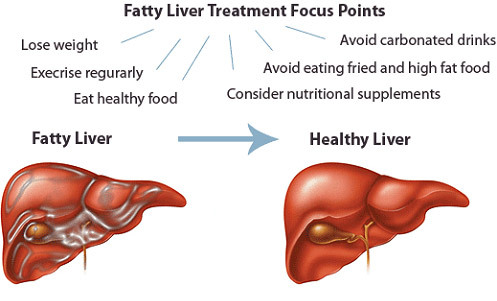 having balanced diet, doing regular exercise and gradual weight loss would be beneficial in preventing fatty liver. This would also help in lowering the risk for cardiovascular disease. What is the function of Liver? Liver helps to store fuel (glycogen) made from sugars, breaking it down and releasing it to the blood stream. Fats and proteins are processed and toxins are removed by the liver. Bile, which breaks down the fat present in the foods, is also produced by the liver. What are the symptoms of non-alcoholic fatty liver disease? Usually, there are no symptoms. Sometimes a vague nagging pain in the abdomen can be felt, and NASH may cause a feeling of tiredness. How can I diagnose NAFLD? Liver function tests can help you in knowing the condition of your liver. Abnormal LFT may indicate the presence of fatty liver disease, and then your diabetologist may advise you other tests to rule out liver problem. A scan (ultrasound) of the liver may also reveal the possibility of NAFLD. How serious is fatty liver disease? 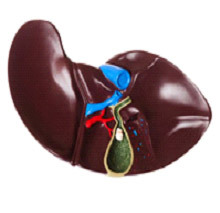 About 2% people with fatty liver develop cirrhosis over a 15-20 year period. However, cardiovascular disease is extremely serious, and reducing the cardiovascular risk factors should be a major goal for people with diabetes. What is the treatment of non-alcoholic fatty liver disease (NAFLD)? Weight loss through lifestyle modifications i.e. having balanced healthy diet and regular exercise can reduce the amount of fat in the liver. Avoid carbonated drinks and high fat content diet. Other lifestyle interventions are stopping smoking and avoiding alcohol to reduce cardiovascular risk. Adopt Healthy Lifestyle to SAVE your LIVER!